The establishment of the international commission for investigation of events that took place in Kyrgyzstan since April, 2010 as well as authorization of such investigation are the today’s tasks for international human rights organizations and diplomats. This was the topic of the meeting of diplomats and human rights organizations that took place in Barcelona in September, 2010 with participation of delegates from over 100 countries. The meeting was organized by Non-violent Radical Party Transnational. Tolekan Ismailova, the head of Citizens against Corruption, also presented the report in Barcelona. - Today, there is no coalition of parties in Kyrgyzstan that could present the program of today’s and tomorrow’s development – Tolekan Ismailova informed Ferghana.Ru. – In the last 20 years of independence the bridges of cooperation and mutual understanding between the capital and regions were destroyed; there is big gap between common citizens and elites that today work as they did before. The government used and uses double standards and deceives… We had display democracy: we have elections but do not have respect to human dignity. However, Kyrgyz experience proved that such democracy cannot survive. I remember February of 2006 when the Iskra village was destroyed. The violence was directed against Dungans with the slogan: "Go away! This is our land!" The later targets were Meskhetian Turks and Uzbeks. When we were defending folks of other nationality we were blamed that we were not Kyrgyz. Kyrgyzstan faces challenging situation and the election rally will be intense. There are new parties, headed by young leaders, but they face serious obstacles even during campaigning. The government has the same old – Soviet – nomenclature. This government put best efforts to demoralize independent journalists, opposition leaders and civil activists, forcing them to leave the republic or change the occupation. The politicians destroy the mechanisms that must help them out. Those, remaining in the system, use double standard and play bad political game because they use weird instruments to come to power. For instance, Tekebaev says that only bullets and rumors can stop them… These words already bear the possibility of violence, the adoption of violence as the form of struggle. Unfortunately, Kyrgyz elite does not have the leader, adhered to the principles of non-violence democratic development – the ideas, developed by Mahatma Gandi and a velvet or Prague revolution of 1968. - Perhaps, the elite has not gone far away from common people? Perhaps, this is the peculiarity of Kyrgyz revolutions when the peace is restored through violence? Former Kyrgyz revolutionaries – those who named themselves as such – never aimed at public reforms. They came to gain the power. The corruption came to Kyrgyzstan in 1993 together with Canadian Kumtor Operating Company (gold mining company). The very first agreement with the company was corrupted and it remains as such today! The current government has not found political will in order to start reforms and bring the republic back to observance of law, justice and accountability. Both Kumtor Operating Company and Centerra Gold Inc are dangerous not only for Kyrgyzstan, but entire Ferghana valley because their presence initiates the constant threat for people and environment. There is no elite in Kyrgyzstan that could put human values as priorities. It will never emerge without coordinated efforts of democratic forces, including NGOs. - The human rights organizations have been the problem since long ago. Today, the biggest issue is the verdict of Azimzhan Askarov, produced by the Nooken district court. Despite constant pressure, put by the relatives of killed policeman, the court did nothing to prevent it. Fair trial could convince the public and process participants that Askarov was not guilty. Observing such violations who would trust fair judicial system? We demand to cancel the verdict and to resume the investigation without any violations of law. The human rights organizations have always been under the control of the previous governments. Many of them were called "the nomads" since they were joining the ruling families. The human rights defender must be independent. When of them shows double standard, the general opinion about human rights advocates is undermined. And people, we protect, are also the double target. - What or who do you mean? - There is no need to join missions or kurultai. We need to work on principles. If Aziza Abdirasulova decided to leave the committee I welcome that because I cannot give good reference to the work of this committee. - Do you believe the unbiased investigation of southern events in not possible? - This is strategic issue. The legitimate President Roza Otunbaeva must show political will and ensure the work of international commission for investigation and this commission must have the mandate. The investigation must be independent, unbiased and professional. Otherwise, there is no move forward in Kyrgyzstan, but the continuation of former politicians that existed before April, 2005. I am very content to see changes in Kyrgyzstan: new Prosecutor General and new Interior Minister…But I expect further reforms. If we do not have unbiased investigation, unfortunately, the conflict may continue and get radical shape. - If people do not get aid or have no access to information resources, they get illegal – we have the experience of many countries. You know that the conflicts between two ethnic groups (Uzbeks and Kyrgyz) took place in Moscow and South Korea…There are tensions. 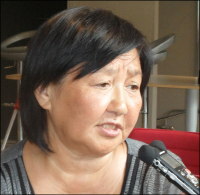 The justice must be shown to the victims of violence in Kyrgyzstan. - Do you have big expectations from Baibolov? - I do not think there is only Baibolov. The current president must have a team that will produce the platform for joint actions. There should be tactics for achievements of set goals. The interim government has the chance to show what they can do before the elections. We need civil institutes that will work on resolution of conflict and restoration of peace in Kyrgyzstan. The international commission must receive its mandate in Kyrgyzstan before the elections. - When are you planning to return to Kyrgyzstan? - I left the country but I work for Kyrgyzstan. We meet human rights organizations, diplomats and with the assistance of international institutes we help many people, suffering in the bloody events… I will come back after elections.